A hand-reared monkey has been given a mechanical surrogate mother to help keep her company. After the birth of the female DeBrazza's monkey by caesarean at Port Lympne Wild Animal Park in Kent her mother was too weak to look after her. To help keep her company, the three-week-old primate has been given a toy monkey with a mechanical heart. The zoo's head of primates, Simon Jeffery, said they hoped to re-unite the infant with her parents soon. 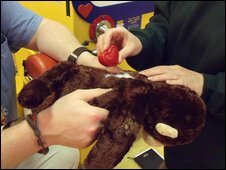 It is hoped the mechanical heartbeat, which is triggered when the monkey squeezes the toy, will help replicate her mother. Jonathan Cage, manager of Canterbury-based Build A Bear Workshop, said: "We were delighted to do something to help and hope that the cuddly monkey will comfort her whilst she is not able to feel the warmth of her mum." 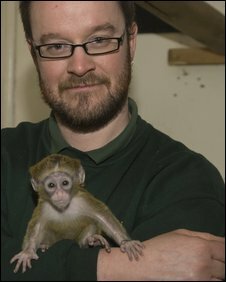 The infant monkey's sibling, Hoggle, was also hand-reared and then re-united with parents Bamboo and Tom, as was a Diana monkey called Keymon. Mr Jeffery said: "Eventually it is hoped that the baby will be able to join her parents, siblings and the rest of the troop. "Both Keymon and Hoggle were re-introduced to the group successfully after a few months so we know from our previous record of hand-rearing primates that this works and it does ensure that they get a good start in life." The infant is expected to be named in the near future. DeBrazza's monkeys have a chestnut forehead, white eyelids, muzzle and beard, black limbs and tail and a white thigh stripe. They are found in forests near water and areas of dense vegetation in central Africa and take their name from Brazza, a French explorer who founded the city of Brazzaville and the French Congo.